In 2005 we opened our showroom at Fahrgasse 17 in Frankfurt. After a loving and elaborative conversion, the first gallery of the Fahrgassen-type was born: the economic miracle architecture of the late forties shone in new splendor, was sensitively revised and adapted to the requirements of a modern gallery. The original character with skylight, canopy, brass window frame, bakelite door pull and grid frame over the radiators has been preserved. Friends, neighbors, co-worker Johanna Pahnke and especially all-rounder René from AGH helped for a perfect start. Around the same time, other colleagues launched new projects in Fahrgasse. Over the following years, more galleries settled. 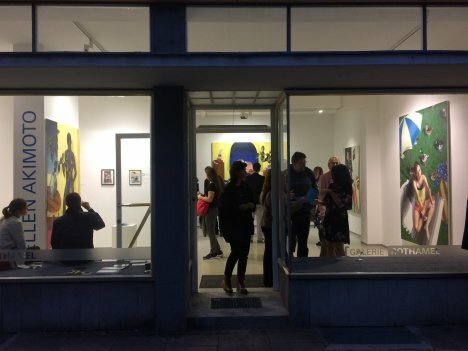 Some disappeared again (without trace or spectacular), but today the street between the river Main and Berliner street houses eight galleries and is a hotspot of the Frankfurt art scene. Where art is shown, restaurateurs like to settle down - art collectors are hungry and artists are thirsty. Meanwhile, the economies are in the majority and social darwinism takes its course. Colleague Carlo Schwind has given up his generous rooms across the street and moves in our former rooms. He is allowed to, because he is the owner. We move on. We will continue to be present in Frankfurt. A temporary alternative address is found and the search for a new fixed domicile is in progress. Unfortunately, the last exhibition in Fahrgasse with papercuts by Annette Schröter lasts only a short time - it runs from January 25, 7 pm to January 26, 4 pm. You and your friends are invited!